Martin Dunn did a long run of hardwood veneered doors recently, and was able to get a good feel to compare his favoured Osmo Hard Wax Polyx Oil v Mylands Hard Wax Earth oil. We are often asked to try out new things by suppliers. Some are most welcome, others not so. I am a huge advocate of Osmo oils and love the Osmo hardwax polyx oil. 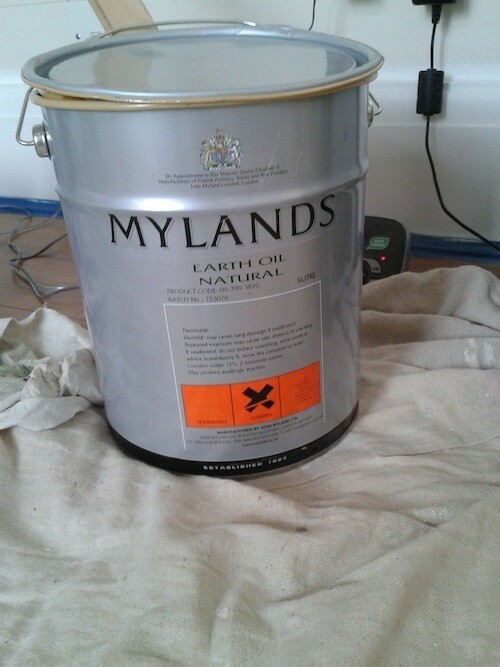 So I was very interested to see how Mylands Earth Oil (as it is now branded) in a natural finish would compare. First off its a lot cheaper!!!!! 5 litres of the Mylands product was about a third cheaper than the Osmo. Down to testing. 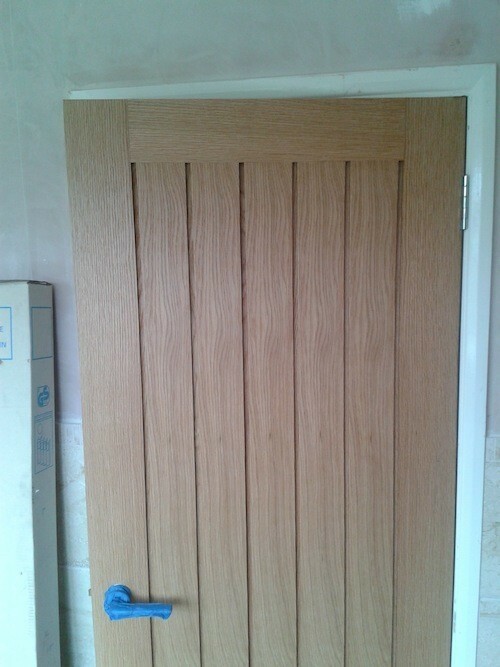 We have an ongoing job that has just had 15 oak veneered doors fitted, so this was perfect to give it a whirl. Our customer wanted to keep the natural appearance of the wood as much as possible, but needed protection as well. The Mylands seemed to tick all boxes with its matt look and natural finish. (It has a very slight sheen, but nowhere near a satin finish) . OK, all oil-based waxes, varnishes and clear stains will darken the wood slightly, but the customer was made well aware of this. Don’t be put off that Mylands say the product is mainly suitable for wooden flooring – which I’m sure it would be fantastic on – it is perfect for new timber. 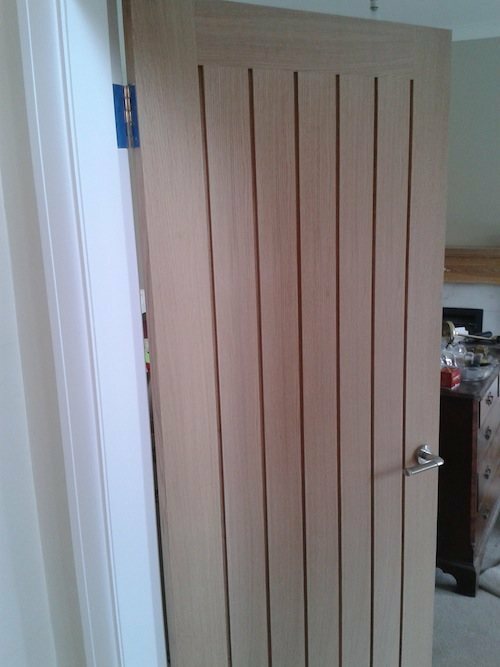 1st coat was applied to a dusted down door – don’t abrade new wood. It goes on a treat. No thinning and no pulling when applying. Touch dry in a few hours and overnight dry for top coat. 2nd coat is applied to the door which has now been lightly abrade to remove timber flare and any splinters, nibs ect. This coat goes on a treat and the door is soon done. 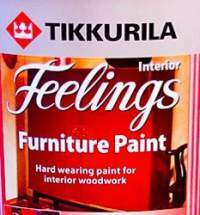 No thinning of 1st coat followed by 2 or 3 top coats – like varnish. No tackiness for days – like Danish oils. Harder wearing than rubbing wax. No cheap look as with some other products. Yes, you could put on another coat of Earth Oil, but it is not needed. The door with the masking tape on the handle is the finished door (each handle has 8 screws each side!!?? holding it on. As we have 30 sides of door to do, masking is the more time effective option). I hope you will agree from the photo that it has kept its natural appearance. For usability and finish, at this time, I would highly recommend this Myland product to Osmo lovers and people who appreciate a bit of timber! Add it to the list of possible treatments for bare timber. I look forward to trying their eggshell out. Thanks for posting this Martin. I keep hearing good things about Mylands. 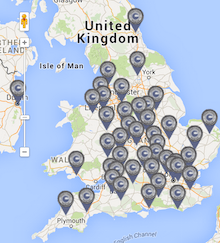 I’ve only tried their Colours of London Marble Matt, and like it. Eggshell next!